It's summer! It's hot and no one needs a hat, yet, I felt inspired to make one. 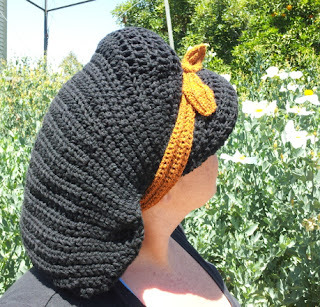 Actually, I felt inspired to make a crocheted wig, which necessitated an under-beanie to help hold the shape, so really it's a double layered heat-trapping super hat. Terrible timing, but funny doesn't care what season it is. And I live for funny! We took the crazy thing to the Fullerton arboretum, because if you've got a heat-trapping super hat, the best thing to do is take it outdoors in 90 degree heat! But it's so funny! 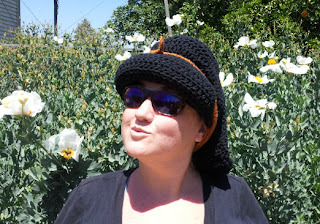 I made everyone else wear the crocheted wig too, because it make me laugh! Mims absolutely fell in love with the giant Ombu tree. We probably played there for an hour. We couldn't get a good photo of Mims and Jake in front of it, because so many people had carved their initials into it. I really hate graphitti. It's just so disrespectful. I did!! It's not very rock-star to admit that I actually felt a little guilty about it. I slip-stitched it to the bench, and left the end dangling so that the maintenance crew could just pull the end to unravel it. LOL!!! 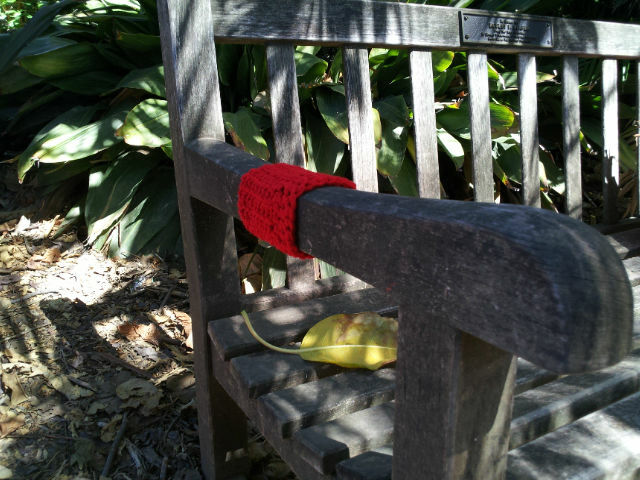 They're having a big yarn bombing event at the OC Fair this year. It's all sanctioned, so I won't feel guilty afterward! oh, cool! I'd love to see pics of that after it happens (I can't even entertain the idea of actually going and participating, the way my life works right now... but maybe in later years).